FESTIVAL PEOPLE EN ESPAÑOL Presented by Target, a multi-faceted celebration of the best in Hispanic entertainment and culture, will once again take over San Antonio, Texas this Labor Day weekend: Saturday, August 31 and Sunday, September 1. Two-night concert ticket packages, starting at $60.00, are available now through Ticketmaster. A mix of live performances each evening at the Alamodome and free open-to-the-public daytime activities at The Henry B. Gonzalez Convention Center, this year’s Festival PEOPLE EN ESPAÑOL Presented by Target will be produced by the legendary, Grammy Award-winning, Cuban-American musician and producer, Emilio Estefan. Festival PEOPLE EN ESPAÑOL will include performances from a diverse mix of musical acts that represent popular Hispanic music. The 2013 Festival PEOPLE EN ESPAÑOL line-up includes Mexican singer and international superstar Alejandro Fernandez; Award winning and chart topping Puerto Rican reggaeton duo, Wisin y Yandel; singer, songwriter and actress Demi Lovato; award-winning singer/songwriter JenCarlos Canela; Texas native Mexican-American Tejano musician Bobby Pullido; and Mexican singer Frankie J. In addition, Festival PEOPLE EN ESPAÑOL’s free, open-to-the-public daytime events offer a wide range of activities that celebrate the best of Latino culture and community. Additional musical performances; Q&A sessions, celebrity meet & greets; sessions with leading industry experts on topics ranging from fashion to wellness; and a sampling of favorite brands through special on-site consumer experiences round out the day time events at the convention center. December 3, 2011 was the first of Three meet and greets sponsored by Blizz Yogurt. 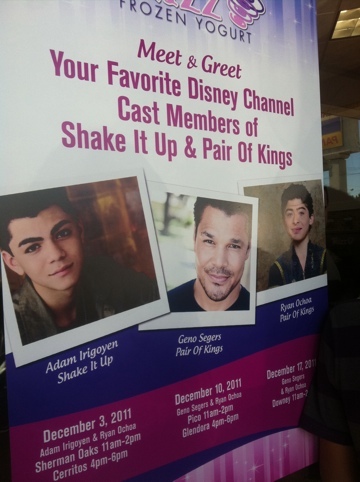 It was at the Sherman Oaks location and Ryan Ochoa from Disney XD’s Pair of Kings and Adam Irigoyen from Disney’s Shake It Up met fans from 11-2. 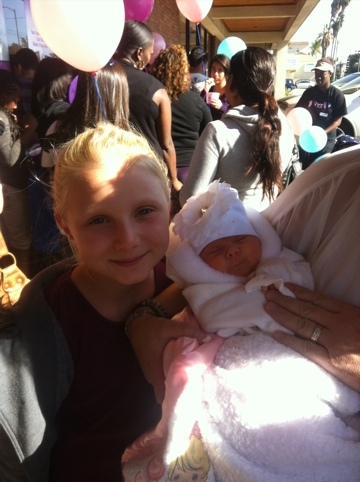 Later that day the two were taken by limo to the Cerritos store where they met more fans! Adam has a brother named Jake who’s 9 and Ryan’s two brothers Robert and Raymond were there as well as his tiny sister, Destiny. 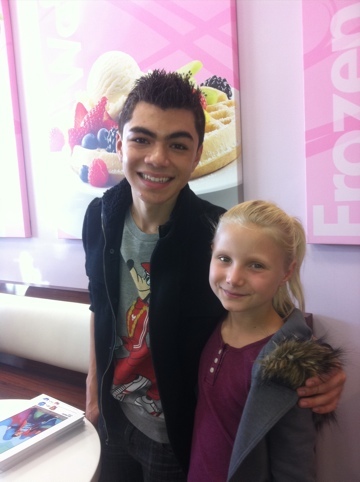 There will be two more days of meet and greets at Blizz Yogurts with Ryan and Geno Segers who plays Mason on Pair of Kings! As you can tell from my pics this is a great chance to meet these stars! Lots of times when you meet stars you are rushed or can’t get a pic or you get a pic and no autograph or you have to wait for hours.., Blizz Yogurt did an awesome job making the meet and greet really fun. If you can make it 12/10 or 12/17 you should go!! December 2, 2011 Sherman Oaks Galleria had a special Tree Lighting Ceremony and some special people helped light Santa light the Tree! Kenton Duty, Caroline Sunshine, and Adam Irigoyen who all star in Disnry Channel's Shake it Up all came out to help kids and families get into the Holiday spirit! Ryan Potter from Nickelodeon's Supah Ninjas was also there to help! The teens helped Santa light the tree then met fans and signed pictures too! Hundreds of kids were thrilled to see their favorite TV characters in person! It was so cute to see them tell their moms and dads "Hey, that's Tinka and Gunther!" and "That's Deuce!" The mall also had juggling elves, Grinch and a snowman walking around. 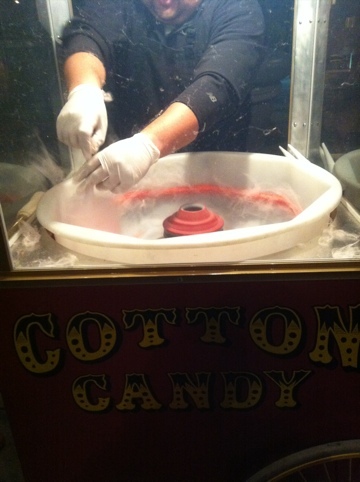 There were arts and crafts, free cookies and cotton candy too! 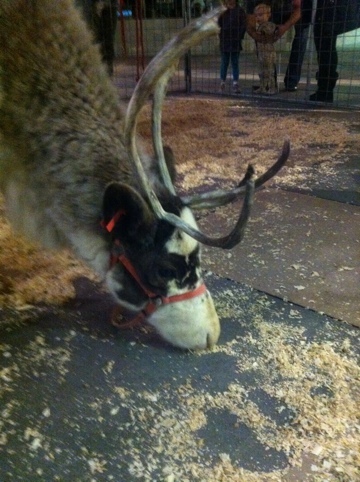 We even saw some of Santa's reindeer! It was a fun night! Thanks to the Sherman Oaks Galleria for doing this for so many families !! Shake it up taping Season 2 5/24/2011, a set on Flickr. 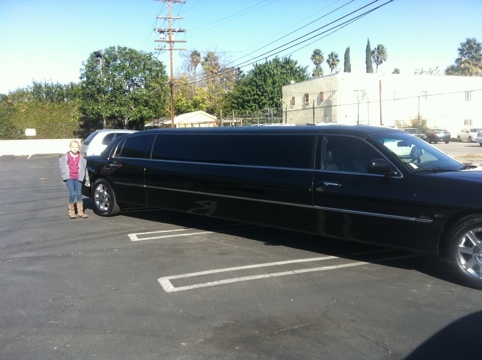 On May 24, 2011 we were lucky enough to be able to go to the first taping of Shake it Up season 2. All the cast members were there except the guy who plays Gary Wilde, Brandon Johnson. We took some friends and all met at LA Center Studios. We watched Model it Up on the monitors while the pages were helping everyone get to their seats, In that episode, a talent agents discovers Rocky and wants her to do a photo shoot! She comes as an angel and Cece tags along as a biker. 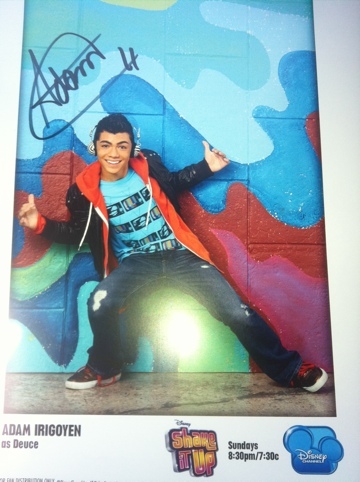 The photo shoot goes really well and the talent agent want Rocky to move to New York! Bella tells everyone to pretend that they are OK with Rocky leaving.. in the end, of course. Rocky stays!! This episode was called Model it up! Then the live taping started. It was fun watching them film, make mistakes, and tape the whole episode! Some scenes were in playback. My hip hop teacher Lindsay Taylor was a back ground dancer! Remi, Kailey Swanson, Hailee Steinfeld and Mason Cook were all there as guests! The episode, called Shrink it Up, had three funny stories all together. Gunter and Tinka decide to be nice to Deuce. Flynn buys a toy dinosaur that doesn’t work well. When he goes to complain he gets hired , along with Ty as toy consultants. Rocky gets annoyed with CeCe always getting her in trouble and deciding things for them both with out talking to her about things! The girls go to a therapist for help. The therapist is really funny. Near the end there are flashback episodes with a young Zendaya played by Jasmyne and a young Bella. We see when they first meet each other and even Gunter and Tinka are in the flash back episode!! SO CUTE!! 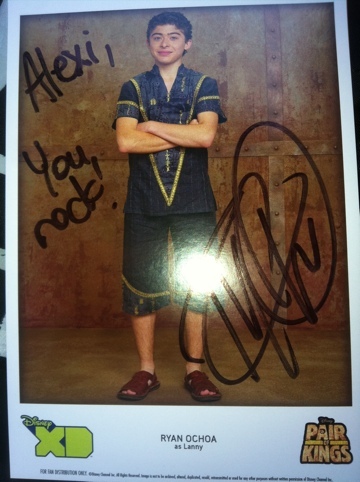 The taping was awesome then after, we got pis and autographs for ourselves and our Twitter friends! We had a blast! !